Happy start of the World Cup 2010 day! Go USA! 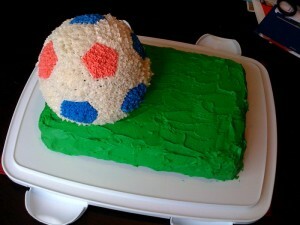 I made a soccer cake for a little get together with our new team at work today. The cake was originally planned as something else with a from-scratch chocolate cake base, but when I tasted the crumbs after baking it last night I was disgusted. I quickly took the opportunity to make a box-mix chocolate ball cake to celebrate the World Cup, which tasted 100 times better. I didn’t have the heart to throw out the scratch cake, so it became the field. I believe I have perfected my buttercream frosting recipe, which I used to frost the entire thing. The sport ball cake pan has instructions and guides for marking off the soccer ball pattern… much easier to execute on the top half and front side of the ball! The hexagon and pentagon guides don’t quite fit right once you reach the other side of the ball, so there were some approximations made that are hardly noticeable. Special thanks to Booze for holding this one steady and preventing disaster on the way to work!